In addition to the linky, I'm taking this opportunity each week to write a little bit about my favorite moments from the past week. I hope you'll feel inspired to leave a comment telling me about your favorite thing(s) that happened this week, too! I've been really sick with a cold this week (Jaymz, too) so mostly this week we've been eating soup and trying not to move too much. However, last weekend—just before I got sick—I attended MommyCon here in Portland and I had a great time! I ran into a few friends while I was there, and I also got to meet a couple of my online/blogging friends. I met Jessica of The Leaky B@@b and she took a nice photo of us together. Jessica spoke about normalizing breastfeeding (mostly about not wanting to have to, which I totally understand) and then she hosted a Q&A session about all things breastfeeding. I particularly appreciated that one of the conference attendees brought up the issue of oversupply and how she feels like she can't talk about what a problem it is because it seems like she's bragging about her abundance of milk (while also complaining about it). Jessica, having dealt with oversupply many times, was very helpful in talking about this particular issue. I, too, dealt with oversupply during my first year of breastfeeding Daniel. I really loved being able to donate milk to several babies who needed it, and at the same time, oversupply definitely isn't without its challenges. The other lovely lady I got to meet for the first time at MommyCon was January of Birth Without Fear. She spoke about her personal birth experiences and then hosted a wonderful Q&A about birth choices. I snagged her for a quick photo at the very end of the day, right before I walked out the door and back into the rain. 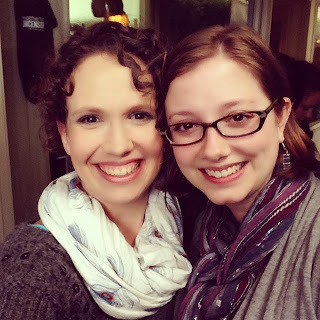 I really enjoyed getting to meet both Jessica (a new resident of Portland!) and January, as they have both inspired me in the past several years. It was such a lovely time, and even though I was thoroughly exhausted at the end (and more than a little overstimulated from all the people), I am so glad I went. I'm also extremely glad I stayed until the very end when the fabulous and hilarious Jamie, a.k.a. The Baby Guy NYC, helped give away all of the baby gear they showcased at the conference. I wish I had gotten a photo of the stage full of swag before they started handing it out, but it was a very fun part of of the day, watching people win things and being a part of the excitement. So many people had left by that point in the day that they had to re-draw names for at least half of the prizes, and I ended up winning one of the last handful of prizes: a new car seat for baby #2! I'm so grateful to have won the car seat, especially now that we have one less thing to figure out before this little one arrives! Overall, it was a wonderful experience, and I would definitely attend again in the future! What was one of your favorite moments from the week? Yay! 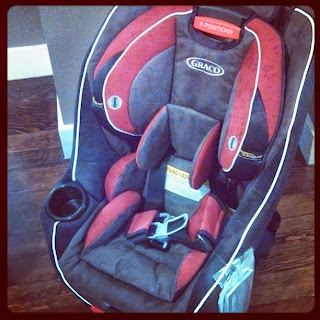 Congrats on the car seat and SO COOL to get to meet some other bloggers you've read! Thank you—I'm still really excited about the seat... I'm resisting going ahead and installing it for fear I'd have to replace it if we had an accident, but I really want to! 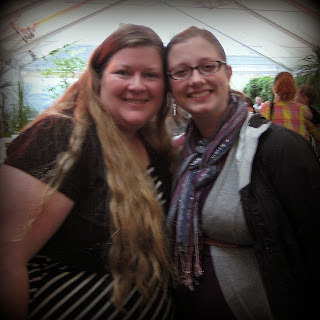 It is always fun to meet blogging friends in person. =) I hope to get to see you again someday, Jorje!